Diet Interactive is an annoying and potentially harmful ad-supported desktop application that may have entered your computer in a “mysterious” way, i.e., it is quite possible that you have no clue how it has got there. We have found that this application can pose a threat to your virtual security not only by its presence, but also by its distribution methods. We have classified this software as an adware program because of its function to display potentially unreliable third-party advertisements. But this adware seems to be only part of a more complex security issue presented by the other malware infections that may have entered your computer along with this ad-supported program. It is also possible that your PC had already been infected when this adware crawled on board. All in all, your system may be in danger if this unreliable software and its “companions” have found a way to infiltrate it. We advise you to remove Diet Interactive because, before long, your computer may be swarming with more malware infections, which might cripple your PC. 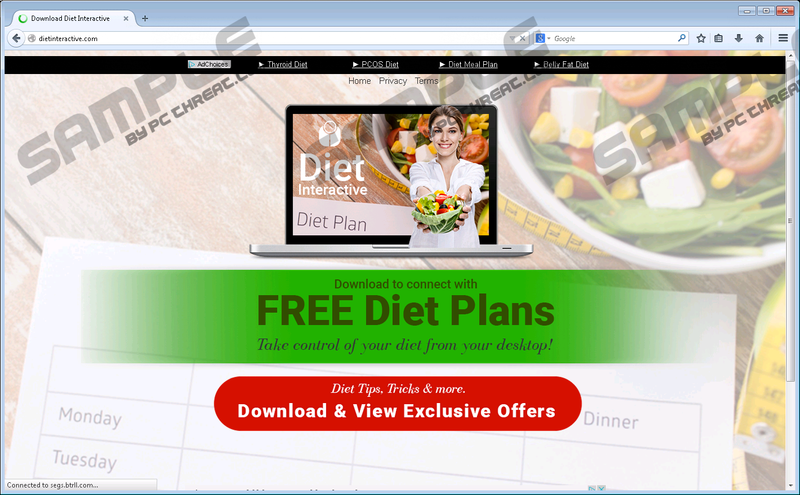 Although this useless piece of software has a promotional webpage (dietinteractive.com), we do not recommend that you visit it. As a matter of fact, you cannot even load this page if your PC is protected by an up-to-date security tool. The moment you send this URL as a request in your browser, your anti-malware application will block it as it detects Trojan infection. If this is not enough for you to question the reliability of this product, we must also tell you that the official installer that you can actually download from this page is packed with other malicious software installers, including MyPcBackup and System Healer. This is rather suspicious behavior since installing the official software means that you allow a number of adware programs, browser hijackers as well as potentially unwanted programs. That is a “nice” lot to have on a computer without proper protection. You must know that deleting Diet Interactive will not solve your problem in this situation. If you allow several threats on board, you need to eliminate them all to restore your operating system and your security. But this is not the only way this adware can sneak onto your machine. We do not even think that a lot of users would find this official page for starters. We have discovered that there are three other ways for this program to land on your system. The most likely way is that you click on a download offer displayed by malware programs or infected websites. It is also possible that you click on a web search result while looking for a free program, for example, and that is how you download this adware. This can happen when your computer is infected with a browser hijacker, which is capable of modifying the search results to include potentially harmful ads and links. Finally, you might download it in a freeware bundle from a suspicious freeware or torrent website by clicking on unsafe content, such as third-party ads. As you can see now, there is no way to escape from multiple threats when it comes to this adware. In any of these cases, it is quite possible that your computer is or becomes infected with a number of malware programs. Therefore, we suggest that you delete Diet Interactive and run a full-system malware scan to know how dire your situation is. Once you start up this program, it opens in its own window and puts its big logo in the top-left corner. It also seems to promote a website, webmd.com, which it opens in its window. However, you cannot use this application as a browser; you will not be able to browser this site properly. This adware also opens interest6.valuedinformation.com/numbers/?t=5&c1=UAOCD%3A%3A in your default browser. Since you can be exposed to potentially unreliable third-party advertising through this application, clicking on these ads may take you to malicious websites that are run by cyber criminals. It is also possible that this adware collects information about you and your browsing habits and put together a profile on you in order to target you with tailored advertisements. However, these relevant-looking ads may be pushed by criminals to lure you onto their malicious sites. You must stay away from such pages if you want to protect your computer. Landing on such sites rarely ends without consequences. That is why we advise you to remove Diet Interactive ASAP. Finally, some good news if you are ready to act. Fortunately, this adware actually has a part that functions, and it is also its best part: the uninstaller. Locate this uninstaller in the installed programs list in Control Panel and run it. That is all you need to do in order to eliminate this undesirable exposure to dangerous content. Please follow our instructions below if you have never uninstalled a program. Also, if you want order on your computer, maybe it is time for you to think about installing a decent anti-malware tool, such as SpyHunter. Keep this tool updated and you will learn what full-time protection is. Press Win+Q and enter Uninstall a program. Hit Enter. Quick & tested solution for Diet Interactive removal.